A Little Love Delivered Daily. We all need love and inspiration in our lives; little reminders that we’re not alone and we’re always cared for. How much the better when we can add a little fun into the mix. That’s why my team of human angels and I have created the “With Love, God” text project. Just the funny little profound tidbits of wisdom and humor you need to hear, delivered right to your phone every day. When you sign-up to receive your 30 days of free Love Note texts from God you will get that little dose of lovin’ you’ve been craving. 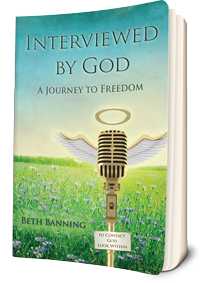 This book is written in a format in which the author is “interviewed by God,” the book is meant to be a mirror for the reader to reflect their own experiences back to them, and a gentle guide for those who are at the precipice of an extraordinary adventure and are either scared to jump or who hunger for answers and understanding. Trust that when the time is right to act, you will know because you will feel it. Copyright © 2014-2019 Beth Banning. All rights reserved.